Traveling is a great source of stress buster, it makes you mentally resilient and boosts happiness and satisfaction. But it’s important to stay healthy when traveling so that you can enjoy your trip and make it fruitful. Jet lag - Jet lag is a physiological condition and it occurs as a result when your body’s circadian rhythms being out of sync with the new biological schedule of destination. 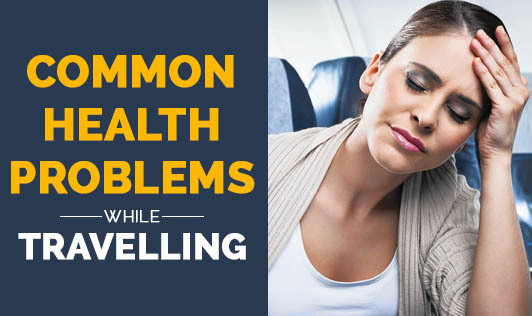 To avoid this problem adjust your sleep schedules a few days before traveling, stay hydrated and eat light foods. Diarrhea – diarrhea during traveling can be caused by contaminated food or water. So to avoid this problem drink water from a packaged water bottle or boiled water, avoid to eat at an unhygienic place and carry sanitizer. Flu- While traveling you could be more susceptible to getting the flu because you are coming into contact with more people as a comparison to normal day to day life, as well as you deviate from your healthy eating, exercise and sleep pattern. So try to avoid close contact with sick people, avoid touching your face because virus gets into your system through eyes, nose, mouth, and face. Stay hydrated, maintain hygiene, eat healthy food and sleep well. Altitude sickness- this is caused by dry air, reduced oxygen level and low barometric pressure at height. To combat altitude sickness drink plenty of water, avoid alcohol, sleeping pills and prefer carbohydrate-rich diet. Motion sickness- it occurs when the brain receives conflicting information from the inner ear and eye. To avoid this uneasiness take a nap or close your eyes, sit in front seat of the vehicle, open window or source of fresh air if possible, avoid greasy and spicy food immediately before and during traveling. Sunburn- it is caused by overexposure to UV rays. To prevent yourself from sunburn apply sunscreen, cover up your body, wear sunglasses. Follow above-mentioned tips and enjoy your trip!! !